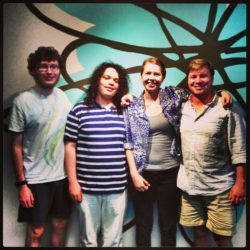 Friday Photo: Etsy Craft Party 2013! Last night we had a blast with local makers at our own Etsy Craft Party – a global gathering of crafters! 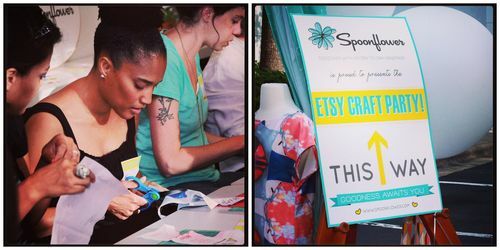 In the Spoonflower Greenhouse, our community space for meeting and making, we celebrated this year’s Etsy Craft Party theme, Craft for Community, with DIY fun! We had a great time crafting with friends here in Durham, NC, folding origami from gift wrap, making fabric covered buttons and earrings, sewing up plushie robots and merit badges! Check out some photos of last night's festivities! Repeat patterns for sale by one of our own!